There was once a kingdom near the treacherous Hemlock Forest where an evil king and his followers dwelt. 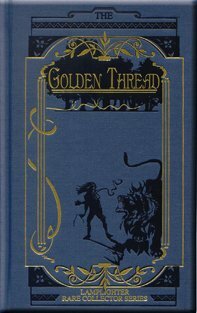 Only those who held on to the Golden Thread could wander past the boundaries of the kingdom and return safely. It is a fearful thing to lose one's way, and Prince Phillip must learn the lessons of the Golden Thread if he is ever to return. An 11 Year Old Boy's Review. From Anonymous of Lyndon, Kansas on 2/2/2017 . The story line wasn't as adventurous as the description for the book so it wasn't as good as other Lamplighters I've read. In the beginning of the story the character was reckless but in the end he made the right choice by having faith.